Versatile and sturdy, modular in-plant offices can be used to add workspaces near any plant or facility’s main operations without sacrificing aesthetics or resulting in operational downtime. 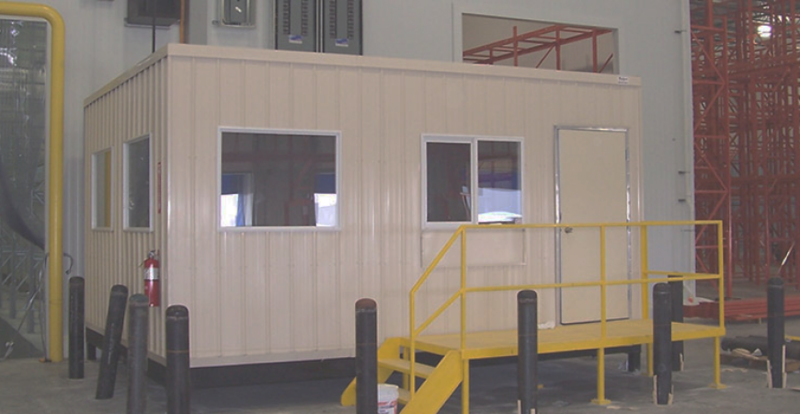 Offering unlimited flexibility, these prefabricated structures are frequently used as offices, restrooms and break rooms, security buildings, machine enclosures, laboratories, quality control centers, and laser rooms. Attractive, versatile, and durable, Speed Space’s in-plant units are highly customizable and can be quickly shipped, often in as little as three or four weeks. Offering significant cost savings over conventional construction methods, our prefab buildings can be easily installed without disrupting operations; they are simply off-loaded with either a forklift or crane and put in place. Our units are suitable for manufacturing plants and warehouses, and serve well as quality control buildings, inspection rooms, management and supervisor rooms, and other factory office needs. Enhanced productivity and communications — These buildings allow companies to more easily bring workers together; for example, some companies use modular structures to move engineers and operations employees closer to manufacturing areas in order to allow for enhanced collaboration and team building. Cost savings — Modular buildings eliminate the need for costly renovations, as are often required by traditional construction methods, so operations can continue as normal. Also, because prices are set from the very beginning of the process, there’s no possibility of surprise costs down the line, as is often the case with structures built from the ground up. Great flexibility — Modular construction can be used to satisfy many different needs in a range of industries and applications; if a space needs to be expanded, renovated, relocated, or even minimized, features can be reconfigured rather than completely rebuilding the space. Increased workplace efficiency — Modular buildings are often installed in order to bring teams closer together and allow managers to better monitor workers and provide helpful feedback, thereby enhancing overall employee productivity. Enhanced safety — Better employee supervision also means increased safety, as managers can more easily watch over employees, processes, and facilities as a whole. Sound and environmental control — In some applications and facilities, noise control or isolation is essential for shielding workers from dangerously loud equipment or ensuring the comfort of the surrounding vicinity. Environmental control is also simplified, as modular rooms and laboratories can be quickly built to effectively regulate temperature and humidity while providing protection against harsh weather and other severe conditions. Quick installation — Because in-plant offices and buildings are prefabricated in controlled environments, installation can be completed quickly and efficiently — generally in approximately four to six weeks from the time of initial approval. This, in turn, minimizes downtime, which maximizes savings. Capital savings — In-plant structures are classified as equipment under tax laws, allowing for accelerated depreciation and significant capital savings. Speed Space’s modular in-plant buildings are fully assembled, wired, and plumbed, making them an ideal choice for any type of indoor use. These buildings easily conform to any workplace environment and offer a sturdy, safe place for conducting business. Our in-plant buildings are available in both single-and two-story fabrications and are expertly installed by a dedicated Speed Space team who will work with you to ensure optimal functioning for your unique needs. For instance, if you’re operating in a small space and require additional offices or control areas, a two-story in-plant office is ideal for expertly manage workflow and productivity. No superstructures or mezzanines are required. We also offer a range of customizable options, including exterior siding (in materials such as steel, aluminum, vinyl, wood, stucco, and brick), interior floor coverings, and special features such as steel wall panels, security window screens, sliding pocket doors, added floor loads, custom counters and cabinetry, diffused lighting, intercom systems, and fire detection and suppression equipment. Speed Space has more than three decades of experience designing and installing in-plant offices, all of which meet or exceed relevant state and national codes. Feel free to consult with us about any special requirements; our experts are on hand to answer any questions you may have. Request a quote today to see how modular in-plant buildings can benefit your business, or contact the team directly to discuss your project with an expert.